This short tutorial demonstrates how to use vroute.premium to find a route and calculate fuel requirements for your flight. You can use our Standard search which lets you find airport by region, country, state - or you can use the Advanced search where you just type two ICAO codes and get a list of routes. The entire database contains more than 70.000 routes and is continuously expanded and improved by large community of users. More than 500 improvements are applied every week. When you're done with searching, press show and proceed to next step. You will now see your route shown on the map together with textual representation showing airways, navigation aids and departure/arrival procedures. Current as well as forecasted weather for your destination airport is shown. Small icons next to METAR text represent important weather conditions, such as storm, snow or fog. vroute will automatically check major nearby airports and recommend alternates for your flight plan. Weather at alternates is also displayed. Click on the Fuel tab to see fuel planning information. Pick your aircraft (more than 25 add-on Flight Simulator airplanes are supported) and enter information about payload as well as flight level. Click Calculate to see the results. vroute is so accurate that it takes into account the current weight of your airplane and the impact it has on current fuel consumption. The more payload you have, the more fuel you will need. Real life FAA regulations were mirrored and vroute takes into account factors such as distance to alternate as well as the size of the departure airport (the bigger the airport, the more taxi fuel is needed). 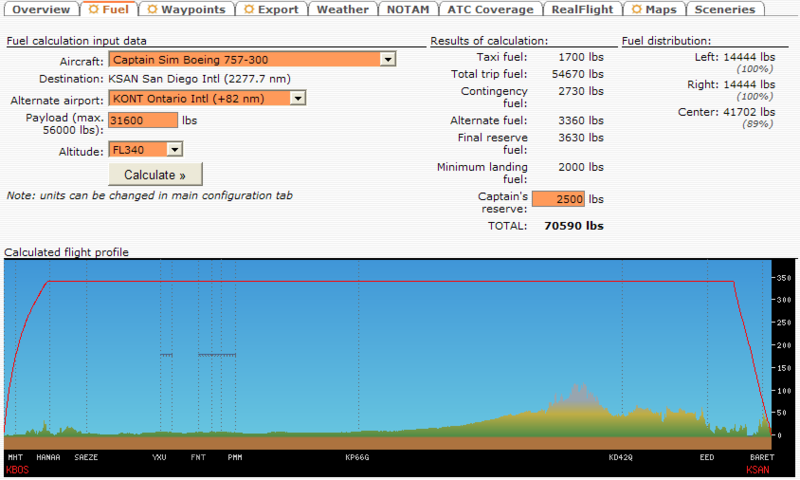 Finally, a flight profile is calculated and shown against terrain elevation. When selecting the amount of fuel to be loaded into each tank, real life procedures are followed to ensure proper structural loading of the airplane. 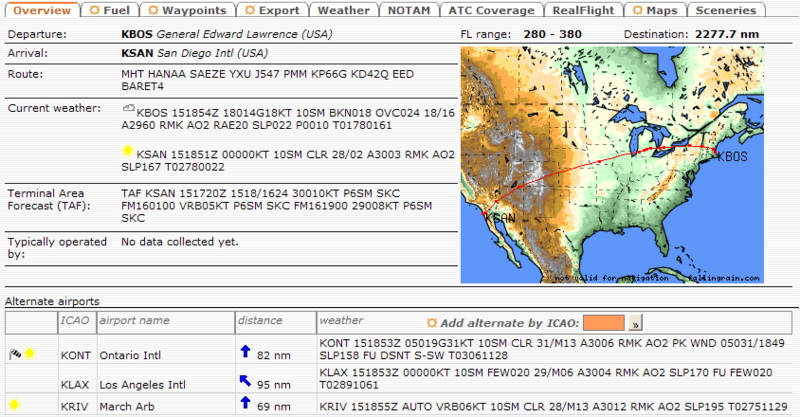 Use the exports tab and pick Flight Progress Card as your export format. Please see sample Flight Progress Card produced for this flight.